A series of bizarre deaths leaves the victims unnaturally desiccated and decaying, sending Jason Dark into the dangerous world of the London dockyards in search of a supernatural murderer. But is the paranormal investigator prepared to duel a full-fledged demon on a Hell-bent mission to create chaos and catastrophe throughout the earth, a fiend determined to wreak more death and destruction than his even more ominous Master? This is the first volume in a series of gothic horror adventures where Jason Dark, a fearless and resourceful ghost hunter, follows in the mold of a Sherlock Holmes combined with Randall Garrett's Lord D'Arcy. 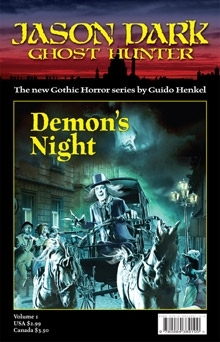 Written by Guido Henkel, the designer who brought Germany's famed Das Schwarze Auge series to computer screens, this series is filled with enough mystery, drama and suspenseful action to transport you to the sinister, fog-shrouded streets of Victorian England. Your encounter with the extraordinary awaits. This product is available in PDF, ePub, Kindle, Mobi, Palm and Microsoft Reader format!